SILICON SLOPES, UT – February 8, 2016 – Today Domo announced that retired U.S. Army General Stanley McChrystal will keynote Domopalooza™ 2016. General McChrystal joins the event’s all-star lineup featuring NBA Hall of Fame athlete and business phenomenon Earvin “Magic” Johnson and award-winning musical artist, Flo Rida. More announcements are coming soon. In 2015, McChrystal released “Team of Teams: New Rules of Engagement for a Complex World,” a New York Times bestseller that outlines how the management of incredibly high-stake, dynamic situations that he and his co-authors confronted in the military can apply to corporate America. 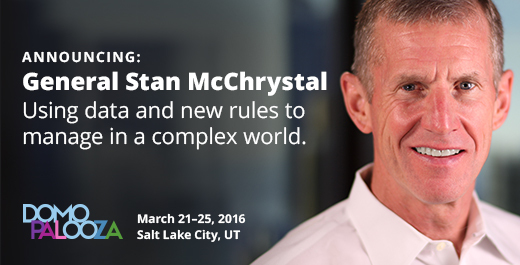 When McChrystal takes the Domopalooza stage, he will share those leadership and management lessons. The retired four-star general will also provide insights into how organizations of all kinds need to be quicker, flatter and more communicative to become a “team of teams” rather than a handful of bureaucratic silos. McChrystal is the former commander of U.S. and International Security Assistance Forces (ISAF) Afghanistan, where his command included more than 150,000 troops from 45 allied countries, and the former commander of the nation’s premier military counter-terrorism force, Joint Special Operations Command (JSOC). He is currently a senior fellow at Yale University’s Jackson Institute for Global Affairs, where he teaches a course on Leadership in Operation. He also sits on the board of the Service Year Alliance, Navistar International Corporation and JetBlue. In 2013, McChrystal published his memoir, “My Share of the Task,” which was a New York Times bestseller. In 2015, Domopalooza attracted more than 1,300 attendees who were director level and above across organizations ranging from mid-sized corporations to worldwide enterprises. Domo anticipates that number to grow to 2,000 senior-level attendees this year.